The Tenant referencing process starts with the Tenant completing your Tenancy Application Form. This gives you the right under Data Protection Act 1998 to take references and complete a Tenant credit check and make enquiries as to their character. 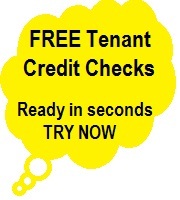 What is my Tenants Credit Score is it good or bad 400 very poor 600+ excellent? You need to inform the bank of the amount of rent payable so they may determine whether or not the tenant can afford such a sum. Some banks are very poor in their response times, whilst others are very guarded and neutral on customer references, however we know of some banks who will say “No, the tenant cannot afford the payment”. To remove such an ambiguity is to ask to see the tenants’ last 3 months bank statements. It then becomes easier to assess lifestyle. How much money they earn and how they spend their money - This is easily determined by reviewing such statements. Do they have an overdraft, do they use it, and are they overdrawn? Habits are easy to assess with the reading of a bank statement. Asking for bank statements is a perfectly normal request and best be cautious of prospective tenants who resist. Tell them you insure the rents and your insurance company insist you see sight of the statements. On the surface an excellent referee but should be considered with caution. If your prospective tenant was or still is in rented accommodation, then this can be a useful reference to obtain. It will allow the landlord to specify how the tenant conducted himself or herself during the tenancy: Was rent always paid on time and in full? Did the tenant damage the property? This could provide an invaluable insight into your tenant’s behaviour and how they are likely to act during a tenancy with you. As a landlord you should favour tenants in full-time, permanent employment, as they are the most secure. The employer is required to confirm the prospective tenant’s salary, how long they have worked for the company and whether or not their employment is likely to continue for the duration of the proposed tenancy. Beware of tenants still in their probationary period or on a fixed term contract which is due to expire soon. A friend or colleague usually gives this type of reference. Accordingly, the reference is highly unlikely to say anything bad about the prospective tenant. It can however offer a slightly increased assurance as to their character. This reference is generally of little importance unless the referee is an individual with a high-ranking position of authority. If you obtain a phone number and should the tenant disappear you can make discreet enquiries, this is better than embarking on a lengthy abandonment or eviction process, worse still defending an unlawful eviction claim.